Spring ephemerals. I love this name. It makes me think of wildflowers and dragonflies. Tissue paper and birthdays. Raindrops and moonlight. The name refers to those short-lived spring flowers that make a momentary yet glorious appearance in the early spring and go dormant in the summer. Trillium is a well-known spring ephemeral, but there are many others that I was recently introduced to at the 2014 Northwest Flower and Garden Show. I went to a talk by Susie Egan of Cottage Lake Gardens and her enthusiasm is contagious. 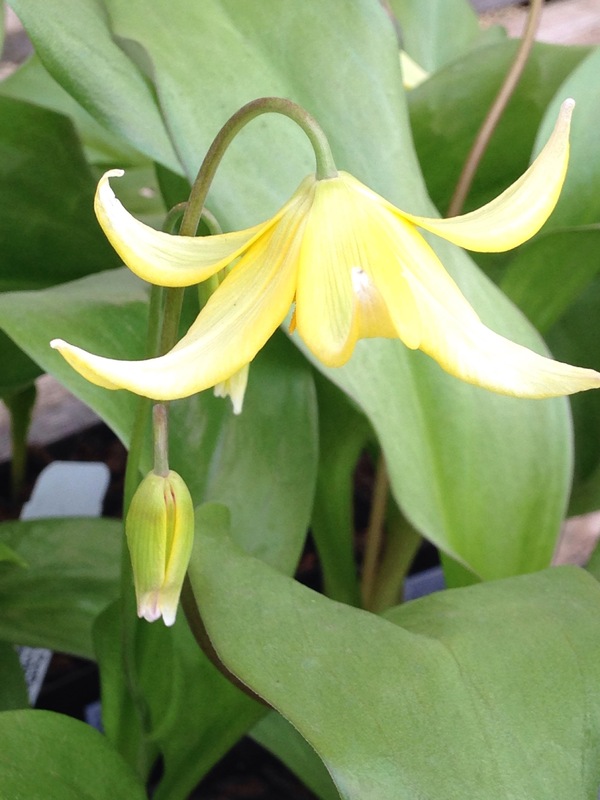 I only bought one plant at the show and it was the erythronium pictured below. My first spring ephemeral! Attributes: Deciduous. Clumping. Showy white flowers with yellow and orange-red center. Shimmering silver mottled foliage. Western White Trillium, Trillium ovatum, Harbinger of spring and beloved native wildflower often brings back fond childhood memories of spring in the woods, fragrant white flowers that age to pink/purple. Giant Trillium, Trillium chloropetalum var. giganteum, Stunning trillium native to California with flower most commonly in burgundy red colors, difficult to find but worth the search. Pink Fawn Lily, Erythronium revolutum, Elegant pink flowers with golden anthers and golden rings within, beautifully mottled strap leaves. Pagoda Fawn Lily, Erythronium tuolumnense ‘Pagoda’, Popular hybrid (cross between E. Tuolumnense and E. californicum ‘White Beauty’) pale yellow flowers with highly visible reddish brown central ring with yellow anthers; glossy, deep green leaves, readily available, easily grown and very vigorous, taller than other Erythroniums. Dark Throat Shooting Star, Dedecatheon pulchellum, Western native from the North Cascades, most floriferous, magenta flower with large white spot and dark ring at base, the tube is yellow here joined and has purple-black near tip, loves moisture. White Shooting Star, Dedecatheon meadia forma album, Such a cute wildflower, this is the white flowered form of the eastern pink shooting star, flower looks like a shooting star, nose cone and all. Robinsoniana Wood Anemone, Anemone nemerosa ‘Robinsoniana’, Popular cultivar with slate-blue buds that open to pale lavender blue with golden stamens. Vestal Wood Anemone, Anemone nemorosa ‘Vestal’, White with double white pompom in center, the ‘Belle of the Ball’, very popular and always sells out at my plant sales. Single Bloodroot, Sanguinaria canadensis, Called ‘bloodroot’ because its roots contain a red-orange sap used as a natural dye by native Americans, has fragile daisy-like flower with yellow center and distinctive deeply lobed leaves. Double Bloodroot, Sanguinaria canadensis f. multiplex (syn. S. canadensis ‘Flore Pleno’, Exquisite double white flower with waterlily-like appearance, worth seeking out. Hacquetia epipactis, The cutest plant! Small, unique yellow flowr with chartreuse petal-like bracts that later turn green. A real charmer. Hacquetia epipactis ‘Thor’, A variegated cultivar, a treasure if you can find one. Pulsatilla vulgaris, Blue-purple, red or rarely white flowering perennial with hairy stems and foliage and dramatic fuzzy seedheads. Pulsatilla vulgaris cultivars, P. vulgaris ‘Red Clock’-red flowers, ‘Alba’-white flowers, ‘Papageno’-frilly, feathery flowers. Uvullaria grandiflora, Eastern wildflower that has yellow dangling twisted flowers about 2 ft. tall, looks nice massed in natural groupings with blue spring blooming perennials. Achyls triphylla, Wonderful native deciduous groundcover with leaves that look like butterfly wings and white bottlebrush flowers, slow to get established but eventually forms a beautiful colony. Hard to find considering it is a native plant. I have many of these natives in my garden and yes they are addicting…but a wonderful addiction. Previous Previous post: New House New Plants!